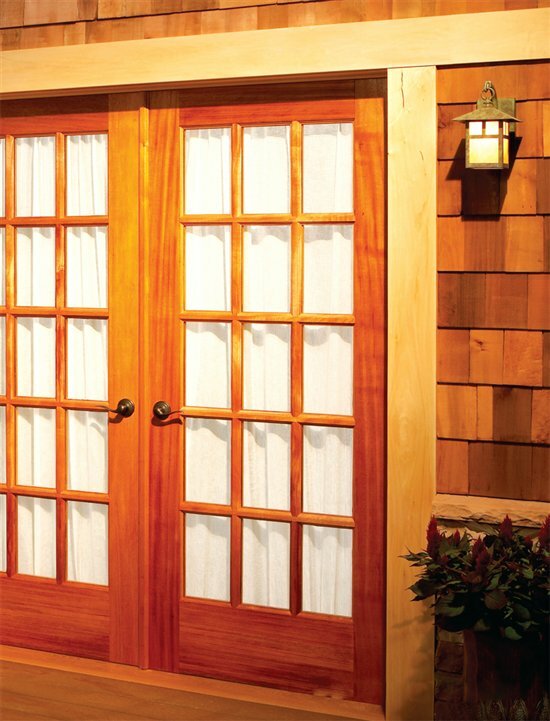 Traditional joinery and stave construction make these doors stable and durable. Let that sunlight in, enjoy the view, and make a grand entrance! French doors are simply doors with windows from top to bottom. Building a set of French doors involves milling many parts and some careful upfront planning. In this story, I’ll walk you through the whole process. First of all, since these doors will be exposed to the elements, it’s a good idea to make them out of rot-resistant hardwood, such as white oak or mahogany. I chose mahogany because its rich reddish brown hues complement the stone and cedar shakes that surround my entryway. And for the greatest stability—a major requirement for entry doors—I decided to make the stiles and rails using stave construction, a building method commonly used by exterior door manufacturers, rather than solid lumber. The key to this project is a new router bit set designed expressly for French doors. This set features specialized bits that allow making rails and muntins with long tenons, for strong and sturdy mortise and tenon joints. You’ll also need a router table equipped with a mid-size router (at least 2-1/4 hp) with variable speed control, a table saw, a bandsaw, a jointer and a planer. 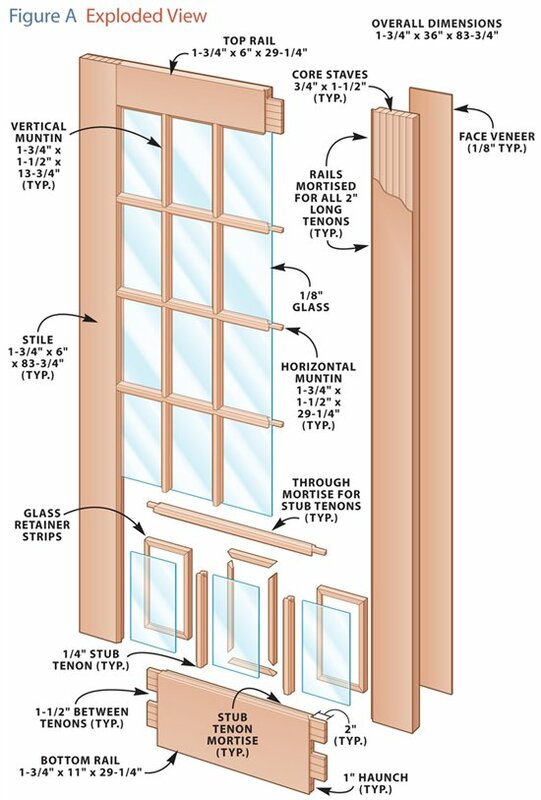 To make a pair of 1-3/4″ by 36″ by 84″ French doors, plan to buy about 110 bd. ft. of 4/4 lumber. Stave core stiles and rails are made by gluing thick face veneers onto both sides of a glued-up core. The core is made from plainsawn pieces that are ripped to width, turned on edge and face-glued. This technique creates flat stress-relieved boards that won’t bow or twist. In addition, these boards are essentially quartersawn, which minimizes seasonal movement. This technique requires more lumber than using solid wood. To make both doors, you’ll need about 50 bd. ft. of 4/4 stock for the core and about 20 bd. ft. for the veneer. I decided to use mahogany for the entire core. You could save money by making the cores from less expensive wood, such as poplar, as long as you use your primary wood for the outside pieces on both edges. Start by picking out your best-looking boards to make the face veneers. These boards should have tight, straight grain and be at least an inch wider and several inches longer than the finished stiles and rails. I cut my veneer just over 3/16″ thick .Using 4/4 lumber, you’ll get three pieces of veneer from each board. It’ll take two 6″ pieces of veneer to cover each face of the bottom rails. A drum sander is the perfect tool to surface the veneer. You’ll get very consistent thickness and no tear-out. A planer with a sled to support the thin veneer will also work. Next, rip the core staves to 1-7/8″ widths, turn them on edge and glue them together face-to-face to create 1-7/8″ thick blanks. Glue up these blanks at least 1/2″ oversize in width. I glued together seven pieces for each stile and top rail, and thirteen pieces for each bottom rail. This leaves plenty of material for flattening and squaring the glued-up blanks. Use short pieces of angle iron to help keep the staves flush during glue up. Let the cores dry overnight, then scrape the excess glue from one face and flatten it on the jointer. Surface the other side with the planer and finish at 1-1/2″ thick. Now that both faces are flat, joint one edge and then rip to at least 1/4″ wider than the finished core. Glue up the stile and rail cores, using angle iron to keep the boards flush. The cores are made from 3/4″ thick boards that are ripped to width and face-glued. Next, apply the veneer. I took the time to make I-beams from 3/4″ MDF to assure that my glued-up stiles and rails would be perfectly flat. The beams are 4-1/2″ tall and about 1/2″ wider than the core; they’re glued and screwed together—it’s important to assemble them on a flat surface. These I-beams distribute the clamping pressure evenly over the entire surface of the workpiece. After the glue dries, trim off the excess veneer and rip the stiles and rails to their finished widths. Complete the stave core construction by gluing the face veneers onto the core. Shopmade I-beam clamping cauls guarantee perfectly flat results. before you machine the actual parts. Use test pieces of poplar or other stable, inexpensive wood to make a corner joint and a couple muntins so you get the hang of how everything works. Start by checking your router table: When the bits are installed, they’ve got to stand perfectly square to the table for the joints to fit correctly. Install 1/2″ drill stock in the router’s collet and check for square front-to-back and side-to-side. Slip shims between the router’s base and the table’s mounting plate to make any necessary adjustments. Check your router table to make sure the bits will stand perfectly square. This step is essential for the routed joints to fit together correctly. Next, make a set-up board from stock that’s exactly 1-3/4″ thick—the same thickness as your finished stiles and rails (this piece will be used to position the coping cutter in the next step). Install the stick cutter and set its bottom slot cutter 9/16″ above the table. Then set the fence flush with the bit’s bearing. This bit takes off a lot of wood, so clamp 1/4″ thick spacers to the fence, so that your first pass makes a partial cut. Remove the spacers and make another pass to complete the cut. Install the stick cutter to make a set-up board. Raise the bit until the bottom slot cutter is 9/16″ above the table’s surface. This positions the bit for making joints in the 1-3/4″ thick stock used to make entry doors. Set the depth of cut by positioning the fence flush with the bit’s bearing. Rout the profile in two passes. Clamp spacers to the fence to limit the cut on the first pass. Routing this profile in a single pass removes too much material. Remove the spacers and make another pass to complete the profile and finish making the set up board. The rails and horizontal muntins are the same length, so plan to rout their ends at the same time. It’s easiest to rout the muntins as a wide blank and rip them to width later. Decide which face of each board is the front and which is the back and mark them. Then lay out the tenons. The shoulder on the front side is 1/2″ deeper than the back. Install the coping cutter, using the set up board to set its height. Set the fence for a partial cut and rout all the pieces. Then reset the fence and rout to the layout lines. You’ll have to make several passes. Use a backer board clamped behind the workpiece to avoid blowout on the back edge. Lay out the offset tenon shoulders on the rails and the horizontal muntin blank. The front-face shoulders are farther from the ends. Install the coping cutter to rout tenons with coped shoulders on the ends of the rails. Use the set-up board you made earlier to set the cutter’s height and position the fence. Rout to the layout lines by making multiple shallow passes. Set the fence for one shoulder and rout all the boards. Then set the fence for the other shoulder and go again. Before you remove the coping cutter, make a coped sled to support the muntins during the next routing steps: Rout the edge of a 5″ wide by 30″ long board that’s exactly the same thickness as the rails and muntins and fasten a stop block on the back end. Install the mortising bit to square the back side tenon shoulders on each board. Use the same process to rout the ends of the vertical muntins. The vertical muntins all have short tenons (1/4″), because most of them mount in the horizontal muntins. Square the back shoulders of the rails and muntin stock with the mortising bit. Install the stick cutter and rout profiles on the inside edges of the rails and stiles, and also on the muntins. Follow the same two-step process you used to create the set-up block. For the muntins, rout one edge of the wide blank and then rip off a 1-1/2″ wide muntin. Repeat this process to cut the rest of the muntins. Rout profiles on the inside edges of the rails and stiles and on one side of the muntin blank with the stick cutter. Follow the same procedure you used to create the set-up boar. Rip muntins from the wide blank one at a time. Rout the blank’s edge and rip again. To safely rout the remaining profile on each muntin, insert the shaped edge in the coped sled you made earlier. As you did when routing the other profiles, take off half of the waste on the first pass. On the final pass, clamp both of the 1/4″ spacers to the outfeed fence, to provide support for the muntin. Make sure you clamp the spacers high enough to allow the profiled edge of the muntin to pass beneath. Rout the remaining profile on each muntin using a coped sled. Mount a spacer to support the muntin when you make the final pass. Bandsaw the rail tenons to final width. On the outside edges, cut a 1″ haunch on each tenon. On the bottom rails, divide the wide tenon into two narrower tenons, leaving 1-1/2″ between them. bottom rail into two narrower tenons. Lay out the mortises on the stiles and rails. The rail mortises are only 3/8″ deep. My tenons ended up being slightly less than 5/8″ thick. No problem. I used a 1/2″ Forstner bit in the drill press to get rid of most of the waste, and then finished cutting the mortises with a 1/2″ hollow mortise chisel. Lay out and cut the mortises in the horizontal muntins in the same way. Install each muntin in the coped sled for support and clamp it in your workbench’s face vise to chop the muntin mortises. Lay out the mortises on the stiles. Drill out the waste using a Forstner bit. Square the mortises and widen them to full size with a 1/2″ hollow mortising chisel. se the coped sled to support the horizontal muntins when you drill and square the mortises. Remove all the slot cutters from the stick cutter and replace them with the supplied spacers. Figure out how thick the retaining strips will need to be by measuring the depth of the glass recess, and subtracting the thickness of the glazing tape and the glass. Mill a wide board to the resulting thickness, minus 1/8″. Rout both edges and then rip the retaining strips free. Use the reconfigured stick cutter to rout the glass retaining strips. Rout both edges of a wide board and then rip the strips free. Start by gluing together all the muntins and the top and bottom rails. I used Titebond II Extend, a waterresistant glue with a long open time. Apply the glue with a brush to both surfaces of each joint. Then assemble all the pieces. Clamp one or both stiles in place, without glue, to hold the assembly square until the glue dries. Complete the door by gluing on the stiles. I found it easiest to glue and clamp them one at a time. Glue the muntins and rails together, using one stile without glue to keep the assembly square. Glue on the stiles one at a time. These doors require water-resistant glue, as they’ll be exposed to the weather. Before you buy glass, check local building codes—exterior doors may require tempered glass. Instead of caulking each piece of glass, apply glazing tape in the rabetted recesses (see Sources). Install the glass and secure it by nailing in the retaining strips. Complete each door by installing glazing tape and glass. Make the glass retaining strips easier to install by pre-drilling the nail holes. Freud Tools, Inc., freudtools.com, 800-334-4107, 5-Pc. Divided Light French Door Router Bit Set (Ogee Profile), #98-318, $319. Other profiles are available. TechnologyLK, technologylk.com, 888-663-9830, 1/8 in. x 1/2 in. Black Double Sided Glazing Tape, #ST18X12, 25 ft. roll, $26. Owens Corning Cultured Stone®, culturedstone.com, 800-255-1727, “Country Ledgestone” Cultured Stone (Caramel color) #CSV 20007, $9 per sq. ft.; Watertable/Sill Stone Trim (Buckskin color), #SWT 1371, $11 per 18″ section. 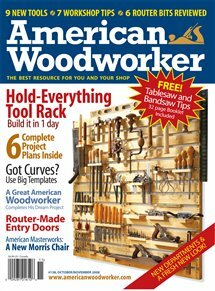 This story originally appeared in American Woodworker October/November 2008, issue #138.